Penelope Smith is the Grandmother of Animal Communication. Long before it was in vogue to be an animal communicator Penelope was courageous enough to let the world know that, “Yes, animals do speak!” She trained animal communicators all over the globe for decades. What is most precious about Penelope’s work is that she is the practice of compassion for all beings in motion. Penelope is gifted with a very big soul ability to accept all beings in love. She is able to come from a place of zero agenda and just get who animals and people are. Instead of fixing, she is listening. Instead of debating, she perceives. She is able to master the skill of witnessing as animals do. As you learn more about her work you can begin to gain this skill yourself. I tuned into Penelope to embrace her soul and this is what I learned about her. She is a channel of a very, very bright light and she embodies the fairies, the dance, the music, the people, the animals, and the elements. She is the light. She has returned to who she really is and she is sharing this so that others may remember who they are. From this special person has come many a CD and book; each one a beautiful experience and read for all animal communicators, healers, and people who are awakening or desire to be lovers of life. Which book, audio, or video is right for you to learn animal communication? and then progress to When Animals Speak. This will ground you in the basics, including "how to" techniques, and go on to more depth in the subject. For comprehensive knowledge and help with animal dying and death, read the Animals in Spirit book. The Telepathic Journey: Opening to the Whole live audio recording gives you a guide on what to expect as you progress on the journey in animal communication to encourage you through the challenges and the leaps forward. Then get the Animal Communication Mastery Series - a must for animal communicator training. All of Penelope's books and recordings can be read or listened to many times as you progress. They are densely packed with practical, insight-inspiring information that can be absorbed in layers as you go over the material. If you cannot do a Basic Animal Communication Course in-person or online with an animal communication instructor or wish to have a preview or review of the fundamentals, then get the How to Communicate with Animals Basic Course CD set. The live lecture Animal Healing Power CD and DVD - Telepathic Communication with Animals give you an overview and many examples to understand the subject. 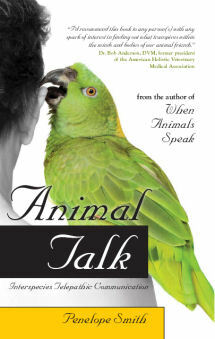 These publications reveal what the subject is about and help families, friends, and other animal lovers to understand and begin to open their own animal communication connection. Some people use these resources at lectures, club meetings, and other gatherings. The DVD - Wild Animals Speak goes into depth on awakening our telepathic connection with wild animals so we can walk in oneness with them. It covers some basic and advanced principles of true telepathic communication. 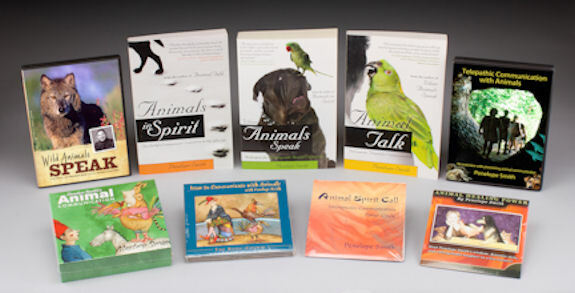 Animal Spirit Call CD aligns with the Advanced I Course, the Deepening and reveals more about the shamanic spirit connection of animal communication. See Events for a description of this course. Evolutionary Leaps with Our Animal Friends, How to Tell if Animal Communication is Real, and other recorded live teleseminars transmit profound spiritual teachings and boost our evolutionary potential as we align ourselves with our fellow animals of all species during the powerful changes of our time. Many professional animal communicators have all of the publications and listen/read/view them many times through the years for further knowledge and inspiration in their work. Wishing you a wonderful journey in the field of communication with all species/all life!